Nationalist Italian interior minister Matteo Salvini branded the migrants as "pirates" after it was announced they were heading towards Malta. Mr Salvini said: "These are not migrants in distress, they are pirates, they will only see Italy through a telescope. "This is clearly a case of organised crime. They attack Matteo Salvini and suggest it's "shameful" for him not to let into his country an army of pirates who despicably hijacked the ship of their rescuers. They even hilariously claim it's "not technically piracy" because piracy needs to involve "two ships" and not one -- even though it did involve two ships! 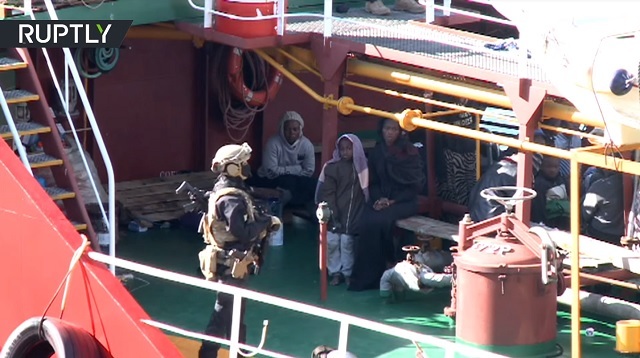 The hijacked ship was seized by the Maltese special operations unit on Thursday morning. It was escorted to Malta�s capital, Valletta where all the migrants are due to be handed over to the police. Several patrol boats and a helicopter participated in the operation to intercept and capture the vessel. [...]There are believed to be 108 migrants on board, around 77 of which are adult men, the Times of Malta reported, citing government sources. Other reports suggested that the number of migrants may be as high as 120. It is unclear how many asylum seekers participated in the hijacking.